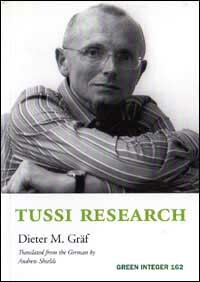 Dieter M. Gräf's most recent collection of poems, Tussi Research, is a sequence on history and Western (especially German) myths. Exploring new aesthetic forms based in part on contemporary art, it uses boldly elliptical language to explore all the Wagnerian tones of fatal longing, generals and swans, failed thinkers and introspective mass murderers, mystic outsiders and saviors of the world, Stalingrad and Auschwitz. The worlds of the German language, anything but cut off from other worlds: following Wilhelm Reich or Lion Feuchtwanger, we are suddenly in the U.S. (Holderlin leads us to jihad and 9/11), or we lose the ground beneath our feet in Upper Bavaria while simultaneously in the Holy Land and in the Nordic empire of new heathens. For this edition, Graf has written his own glossary. As with his first Green Integer book, Tousled Beauty (2005), this collection has been put together in unusually close collaboration with its translator, Andrew Shields. Gräf was born in Ludwigshafen in 1960 and now lives in Berlin. His three volumes of poetry with Suhrkamp are Rauschstudie: Vater + Sohn (1994), Treibender Kopf (1997), and Westrand (2002). He recently edited the anthology Das leuchtende Buch: Die Welt als Wunder im Gedicht (Insel, 2004) and published the CD Taifun (with the composer Volker Staub; Accademia Tedesca Roma Villa Massimo; 2005). He received the Leonce and Lena Prize from the City of Darmstadt (1997) and held several fellowships, including one at Villa Aurora in Los Angeles (1999) and one at Villa Massimo in Rome (2004). He was appointed writer-in-residence at the German Festival in India in 2001 and at the Deutsches Haus at New York University in 2005.